In 1880, William Rideing described the sewing needle as “the natural weapon of every woman who has to battle for herself in the world.” For centuries, sewing has been an integral part of women’s lives and education. Any examination of women’s roles, whether in the home or as wage-earners must include both household sewing and work in the needle trades. 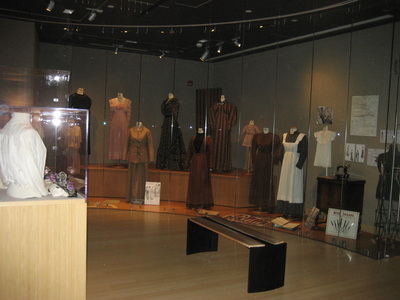 Women were the primary producers and/or purchasers of their own and their family’s clothing throughout the 19th and into the early decades of the 20th century. 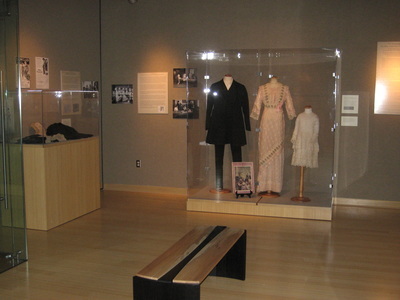 After World War I, their role shifted to that of consumer, with increasingly fewer items of clothing created in the home. In addition, sewing - including factory, dressmaking, and repair and alteration - was a primary source of income for women. The focus of this exhibit is women and sewing, centered on clothing rather than fancy needlework such as embroidery. 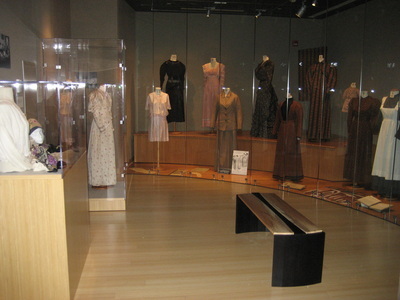 Three themes are examined: sewing education, sewing for home and family, and sewing as wage-work. 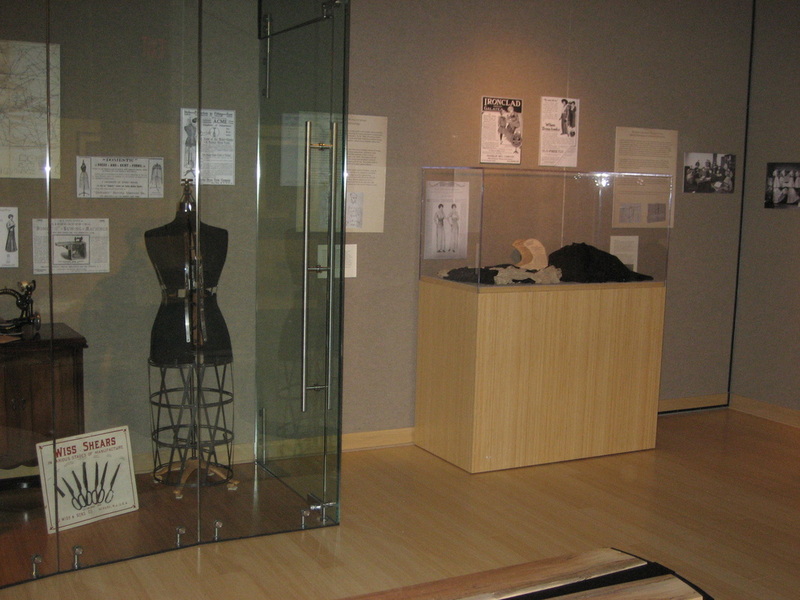 The themes are addressed through the objects women produced, the technologies they used to produce them, and the records they left behind in the form of sample books, invoices, ledgers, photographs, and instructional materials. By the end of the Civil War, women were no longer responsible for making men’s clothing, as most, if not all, was purchased ready made. However, throughout the nineteenth century, women relied on seamstress, dressmakers, or their own sewing skills to clothe themselves and their children. This custom production ranged from simple garments made at home, either by a family member, seamstress or dressmaker, to elaborate fashionable gowns made in an exclusive dressmaker’s shop. 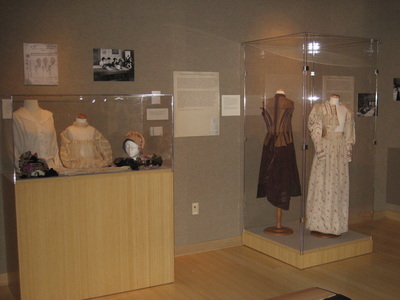 The manner in which women clothed the family depended on financial resources, sewing skills and individual interpretations of fashion and class. They used the resources available, and balanced budget needs with other factors, including time and desire. 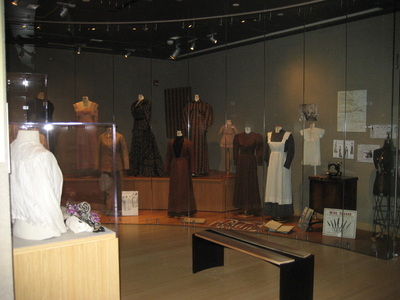 By the 1890s ready-made clothing had significantly entered the wardrobe decision-making process for women in the form of shirtwaists and skirts. Exhibit curated by Jean L. Parsons and Sara B. Marcketti. Thanks to collection assistants Tekara Stewart, Erica White, Ashley Ratute, and Carmen Keist and collections manager Jan Fitzpatrick for their assistance. 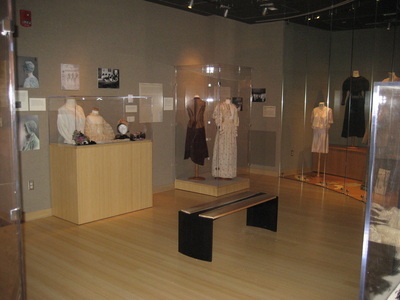 This exhibit was partially supported by the College of Human Sciences, Dean Helen LeBaron Hilton Grant, 2008-2009 and the Department of Apparel, Events, and Hospitality Management. 1 Martha Bensley Bruere and Robert W. Bruere, Increasing Home Efficiency (New York: The Macmillan Company, 1914),162. 2 See For example, “To Teach Cooking: An Outgrowth of the Work of the Sewing Schools,” The Baltimore Sun, 8 September 1899, 10. 3 Claudia Kidwell, Cutting A Fashionable Fit: Dressmaker’s Drafting Systems in the United States (Washington, DC: Smithsonian Institution Press, 1974), and Wendy Gamber “The Female Economy: The Millinery and Dressmaking Trades, 1860-1930.” (Ph.D. diss., Brandeis University, 1990. 4 Laura V. Davis, “Sewing in Baltimore Public Schools,” The Maryland Educational Journal 1(March 15, 1906): 23-24.